Some current IGetMail users will be able to apply the upgrade to IGetMail version 4.1 at no charge. If you are running IGetMail Version 4.0 you will be able to download the IGetMail version 4.1 Setup program and complete the update process without entering a new license key. If you are using an IGetMail Version 3.x or older license, you will need to purchase an upgrade license at a discounted price in order to apply the upgrade. In summary, if you are running IGetMail version 4 you can upgrade at no charge. Otherwise, you will need to purchase an upgrade to IGetMail. Note - You will not need to re-boot your system at any point during the upgrading process. 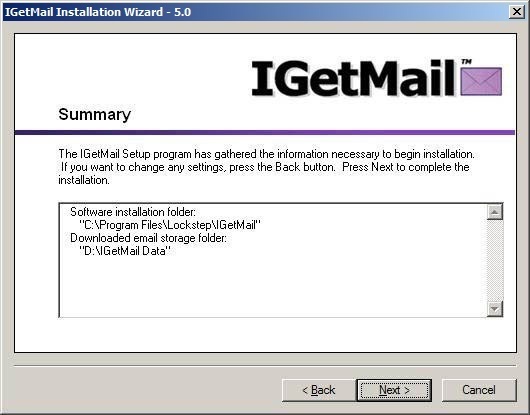 Download the new igmsetup.exe file to the computer that is currently running IGetMail. Please note that the IGetMail Setup program automatically detects the presence of a prior version of IGetMail and will install the new version in the same directory as the old version resides. Double-click the igmsetup.exe file to begin the upgrade process. Now you see the opening screen to the Installation Wizard. Press Next to proceed. At the License Agreement screen, press I Agree and then press Next. Review the Summary information. If you would like to make any changes before IGetMail is updated on your computer, you can press the Back button. 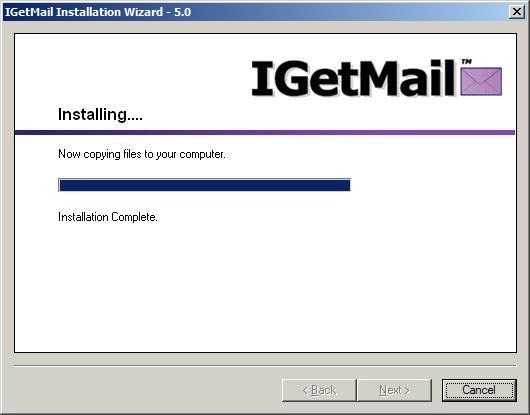 If you would like IGetMail to start copying its program files now, press Next. IGetMail shows you a progress bar while installing its program files to your computer. When all of the files have been copied to your computer, you will be able to press the Next button. Now you see the IGetMail Administrator program. The information in the Accounts Panel should be exactly what you had before upgrading. You will need to purchase an upgrade license key in order to use the new IGetMail version 4.1. Please visit this webpage to go to the IGetMail v4.1 upgrade order form. Once you receive your upgrade license key via separate email, you will be ready to follow the steps below. The upgrade key will replace your existing IGetMail license key and you will need to enter the upgrade key into the IGetMail Setup program. The setup program will detect whether your existing license key is version 3.x or older. Then the setup program will display a dialog box where you can now enter the upgrade license key. If you have not already purchased your upgrade license key, then do so now by going to the purchase tab at the top of this page and then fill out the order form to purchase an IGetMail upgrade. Once you have your upgrade key, you will enter it now. NOTE: IGetMail License Numbers starting with IGM1xx and IGM2xx are not compatible with IGetMail Version 4.1. If you decide to upgrade to IGetMail Version 4.1 you will need to purchase a new License Number. IGetMail Version 4.1 gives you new options and new features that were not available in prior versions, so we encourage you to review the list of "What's New in Version 4.1" to read about the new features and see if any appeal to you. If you see new features that you would like to use, you can download the trial version and use it for 15-days. To try the new IGetMail Version 4.1, you can download the 15-day trial version and install it over your existing IGetMail software. Version 4.1 will read and use the settings that you are using in your current version of IGetMail; so you will continue receiving your POP3 email without disruption. 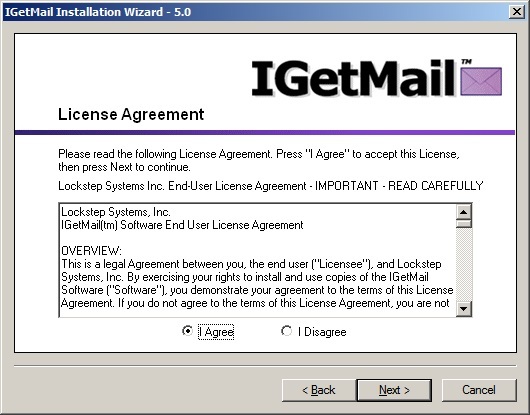 Keep in mind that you will need to purchase a new license to continue using IGetMail Version 4.1 past the 15-day trial period. Your old license key will not work in Version 4.1 - you will need to purchase a new IGetMail license key. After downloading and installing the 15-day IGetMail trial software, you will need to run the new IGetMail Administrator user interface to access the new features. For example, let's say your web hosting company is now requiring TLS access to your POP3 email account. 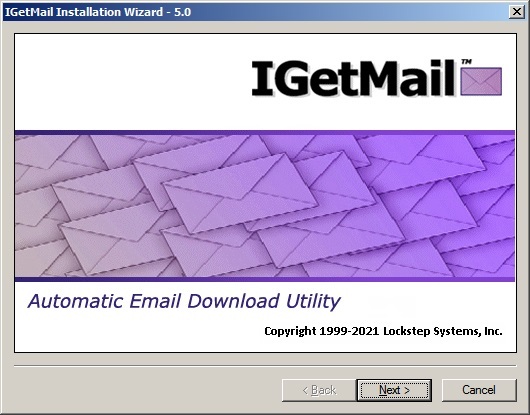 You can install IGetMail Version 4.1, which will read your current POP3 email account settings, then you can run the IGetMail Administrator to activate the SSL/TLS option. Be sure to check out how to implement a couple of the most popular new features at the bottom of this page. At the Storage Location dialog, we recommend that you accept the default location recommended by IGetMail. This is where IGetMail will keep a copy a limited archive of your downloaded email. Now you see the IGetMail Administrator program. The default view shows you the Accounts panel. You can use the Accounts Panel to watch IGetMail download your email in real time. 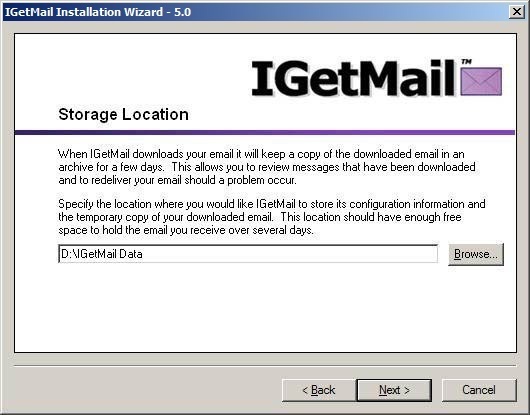 In the top portion of the panel, you should see your list of POP3 Email Accounts that you had been downloading from when using the prior version of IGetMail. In the bottom portion of the panel, you should see your local Exchange Server / SMTP compliant server. Your copy of IGetMail has been upgraded to the 15-day trial of IGetMail Version 4.1. You have 15 days to use the new features of IGetMail and you will need to purchase a new license key to continue using IGetMail past the 15-day time limit. If your remote POP3 Accounts now require SSL/TLS - At the Accounts Panel, select the name of the POP3 Account that requires SSL/TLS encryption. Press the Modify button. On the Modify POP Account dialog, check/tick the SSL/TLS option. Press Next and proceed through the wizard and save your changes. IGetMail will now use SSL or TLS when accessing the email in this POP Account. If your Exchange Server now requires authentication - At the Accounts Panel, press the Modify SMTP Settings button, which is in the lower left hand of the screen. At the Configure Local Email Server dialog, check/tick the Authenticate As option and be sure to enter your User Name and Password for an account on the Exchange Server that is configured with the rights to send email. If you would like to leave a copy of the email at the remote POP3 Server - At the Accounts Panel, select the name of the POP3 Account for which you would like to leave a copy of the email on. Press the Modify button. Proceed through the wizard until you get to the Configure Remote POP3 Accounts - Leave Mail at Remote POP3 Server dialog. Check / Tick the option to "Leave a copy of the email on the POP3 server for X days." You can enter the number of days you want to leave email on the server for. Press Finish to save your changes. When IGetMail pulls your email for this particular POP3 Account, it will leave a copy of the email on the remote server for the number of days you have specified. If you would like to add another POP3 Account to IGetMail - At the Accounts Panel, press the Add button. Proceed through the wizard and enter the information to access the email at this account. If you would like to review the downloading Schedule - Go to Tools > Preferences. On the Scheduler dialog, you will see the list of current download schedules that IGetMail is following to download your email. You can modify these schedules or add new schedules at any time. download the 15-day trial software and update your IGetMail software today!